Districts from all over the state traveled to Phoenix to attend the Evidence-Based Digital Curriculum Takes Center Stage in Arizona Classrooms seminar co-hosted by Crane Elementary School District (CESD) and Assessment Technology Incorporated (ATI). Attendees received a first-hand look at Dynamic Curriculum Strategies, a curriculum solution by CESD and offered through the Galileo Digital Curriculum Platform from ATI. Speakers presented the evidence-based curriculum aligned to Arizona State Standards which teachers could easily begin using in the classroom. The curriculum supports a logical approach to assessment and interactive instruction with opportunities to personalize learning for students with a spectrum of needs. It is provided through the Galileo Digital Curriculum Platform where it is integrated with the Galileo assessment and reporting components. 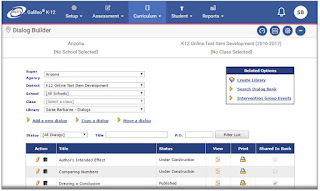 The intuitive Platform makes it easy to merge curriculum content with formative/benchmark assessments and reporting. The Platform also empowers educators to deliver evidence-based differentiated instruction and quickly evaluate the impact of curriculum and instruction on student mastery of standards. Galileo® is designed to be truly flexible, enabling teachers to assess mastery of specific skills and objectives in a way the works best for them. Galileo includes multiple easy-to-use assessment creation interfaces including those in Test Builder and Dialog Builder. Both of these interfaces have undergone redesigns that make developing formative assessments and Instructional Dialogs (including integrated assessments) even easier. 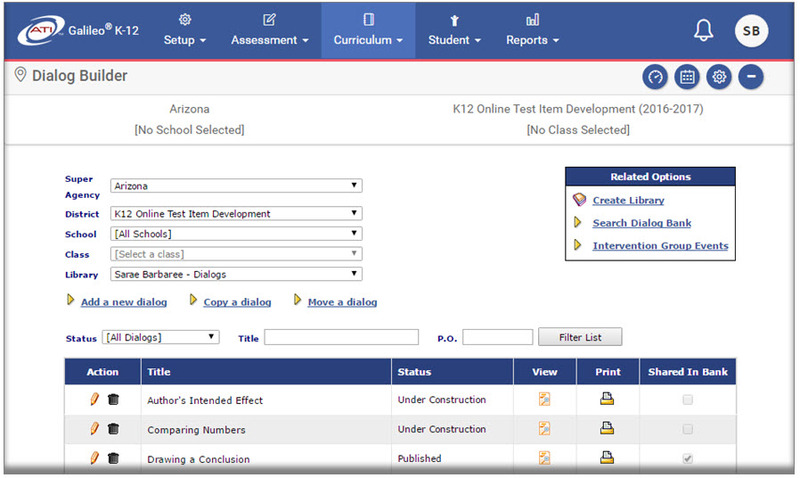 These interfaces provide teachers with the ability to quickly and easily create tests from the Galileo Community Item Banks, the Inspect® item bank, or District-created item banks as well as to create their own items (including TE items). Additionally, Galileo includes technology to import assessments created outside of the system. And there is more to come. We plan to include an enhanced Item Builder in Test Builder. It will enable teachers to create multiple types of items including selected-response, constructed-response, and technology-enhanced items. Creating a TE item within the integrated Item Builder. 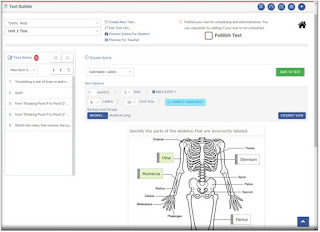 The Dialog Builder interface is supportive by automatically generating formative class assessments built directly into online Instructional Dialog lessons and assignments. Dialogs make it possible to assess what is learned and guide learning by providing immediate feedback during the learning process. Dialogs may include multimedia content such as images, video presentations, and sound and can be viewed correctly on desktops, laptops, and tablets. Redesigned interface of the Galileo Dialog Builder. If teachers want to use assessments created outside of Galileo – no problem! The assessments can simply be uploaded using Automated Scoring Key (ASK) technology. 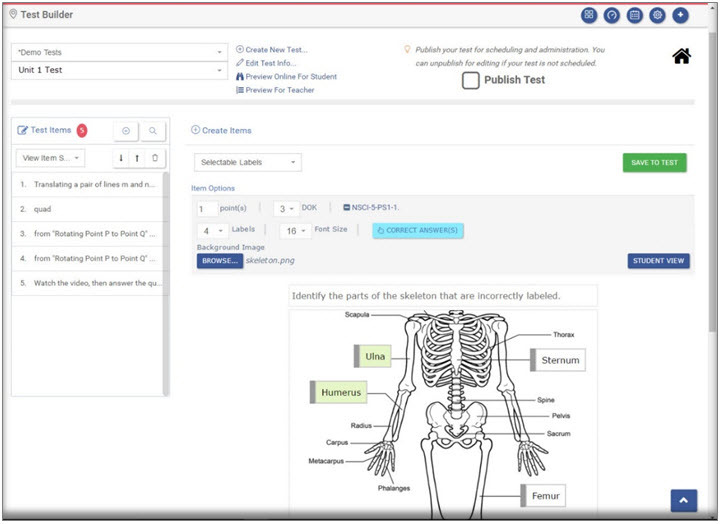 Teachers can even upload an existing test booklet and create an answer key shell including the standard (optional) and correct response for each item on the assessment. Once created, ASK assessments can be scheduled, administered, scored, and reported on like any other assessment within Galileo.